If knowledge is, as they say, power, then you will find great empowerment in Teresa Tomeo’s latest book Extreme Makeover (Ignatius Press, October, 2011). 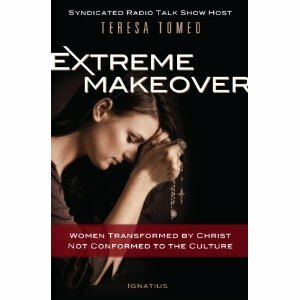 Extreme Makeover: Women Transformed by Christ, Not Conformed to the Culture offers an excellent combination of facts, statistics, and personal testimonies to make this the sort of book that any reader will find valuable. Relying on her background as a reporter, Tomeo “finishes” many stories that the media has ignored or left unsaid. For instance, many pro-life advocates have an idea of the NARAL agenda but how many know that one of the NARAL founders, Bernard Nathanson, eventually left his abortion practice and ultimately converted to Catholicism — stating that NARAL greatly deceived the American public on the issues of abortion? Just as she does on her daily EWTN talk show, Tomeo helps the reader (or listener) “connect the dots” in a way that the knowledge does become power and makes each of us better equipped to witness to our faith. Tomeo beats down the satan-like voices intent on destroying the gifts of love, forgiveness, and salvation we have in Christ. She fervently witnesses so that we, too, may embrace what has been offered to us as daughters of the King. It is always evident that Tomeo’s love of her faith propels each word she puts on the page. “The Abortion Distortion” is only one of the many wonderfully-crafted chapters of Extreme Makeover. “Mirror, Mirror” reverberates with Tomeo’s passion to explore and then conquer the low self-esteem problems faced by so many young girls and women today. (Mirror, Mirror on the Wall is also the title of one of Tomeo’s best-selling All Things Girl books devoted to tween girls.) “Extreme Media Makeover” examines the media’s sloppy coverage of Pope Benedict’s words on condom use and HIV; but because Tomeo never leaves the reader without resources, she also examines the ways in which our own excursion into social media can be used to defend and promote the teachings of the Catholic Church. Tomeo’s ability to draw together a myriad of resources — using excerpts from documents as profound as Humane Vitae, quotes from such figures as Bishop Aquila, statistics from the likes of American Academy of Matrimonial Lawyers, and references to the works of people such as Janet Smith — is an invaluable gift of edification to the reader, a gift that ignites and inspires the reader to love and share the precious gift of her Catholic faith. Just the way a good reporter ought to end a story, Extreme Makeover: Women Transformed by Christ, Not Conformed to the Culture concludes with the compelling testimonies of a handful of women who have experienced their own “extreme makeovers” and generously share their stories of struggle, heartache, hope, and ultimate joy. From start to finish, it is clear that Tomeo has one goal in mind: that each woman who reads this wonderful book will be transformed in one way or another — that each woman will experience her own extreme makeover. Note: You can find Teresa on Facebook. To read Teresa Tomeo’s full personal story from Secular Anchor to her current role as Evangelist in radio and in print, read Newsflash!